When Bowser Jr. was revealed as a fighter in Smash 4, people were very excited of what he would offer. At the time there were only five Nintendo villains in Smash Bros., so seeing Bowser Jr. along with all seven Koopalings was a breath of fresh air. In-game, Bowser Jr. was considered an alright character, but not terrible. In Ultimate, however, it’s a different story. Similarly to Little Mac, Bowser Jr. got slightly buffed but ended up getting heavily nerfed because of the new game engine. Many people now consider Bowser Jr. to be one of the worst characters in Ultimate. That statement isn’t always the case, as Bowser Jr. has some very good moves up his sleeves. 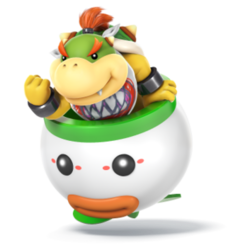 Bowser Jr. has a very strong offensive game and it falls under the archetype of a ‘bait & punish’ character. These characters heavily rely on pressuring opponents, either by projectiles or by sheer speed, and manipulating their behavior in battle. This makes them punishable for their mistakes. Other characters that fall under this criterion are Wario and Zero Suit Samus, since both of them are able to use their projectiles or speed to get close to the opponent and overwhelm them. Bowser Jr. has tools for punishing his opponents in their confused state: his quick tilts (weaker hits), his multi-hitting smash attacks (stronger hits that are hard to escape), or his long reaching grabs. He also has combo-related attack;: his Up-Throw has just the right knockback that it can combo into any of his aerials. His grounded Up-B, ‘Abandon Ship!’, grants him a lot of extra mobility, which helps to KO opponents at high enough percentages. There are, however, some bad aspects of Bowser Jr. that players should be aware of. His Up-B is a very risky option since he can get hit once, fall off the ledge, and can’t recover again. His Side-B can also launch him offstage and his Down-B can be used against him. As a side note, because of the new mechanic in Smash Ultimate, Bowser Jr. cannot be damaged by his own Mechakoopa (Down-B) anymore, so using it as a recovery option won’t work. However, his Side-B is already a great horizontal recovery option, so he never really needed it. Overall, if you’re thinking of maining Bowser Jr., use him with precaution since you can just as easily mess yourself up as you can mess up others. Overall, while Bowser Jr. might not be the greatest of options compared to other ‘bait & punish’ characters, he can still hold his own in a fight. Just remember that if you choose Bowser Jr. you’re playing the underdog game, as you would if you chose Little Mac or Kirby. You start at the bottom as the character that no one expects to win and it’s your job to prove all of them wrong. If you’re learning how to apply constant pressure to the opponent, or if you like tricky ‘bait & punish’ characters that have the ability to mess with people’s heads, then Bowser Jr. is the character for you.